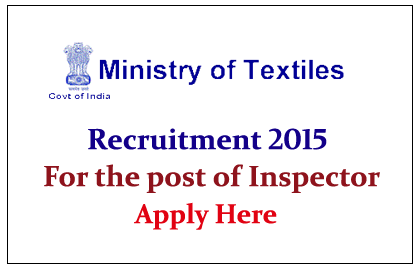 Ministry of Textiles is Recruiting for the post of Inspector for the year of 2015. Location at Kolkata. Eligible candidate can apply here on or before 09/05/2015. The Jute Commissioner ,office of the Jute commissioner, CGO Complex, E&F Wing, 4th Floor,DF Block,Sector-1 ,Salt Lake City, Kolkata – 700064. Eligible Candidates can send application filled with Annexure - I to above Postal address on or before 09th May, 2015, for more details check official Notification.